With the Christmas spirit we’re living in these days , starting the fast of the Advent , Kiahk praises and this divine celebration , we remember the verse coming out of Zecheriah’s mouth by the Holy Spirit , who said ” To give knowledge of salvation to His people By the remission of their sins, Through the tender mercy of our God, With which the Dayspring from on high has visited us ” ( Luke 1:77-78). The word orient or east makes us turn our eyes towards sunrise and our ears to that word in the divine revelation . We find that God has placed a ” cherubim at the east of the garden of Eden, and a flaming sword which turned every way, to guard the way to the tree of life.” (Genesis 3:24). The tree of life refers to the Lord Jesus, the Son of God in flesh for the salvation of the human race. In Psalms , the prophecy refers to the incarnation of Jesus Christ , who is more beautiful than all humans ” Out of Zion, the perfection of beauty, God will shine forth. ( Psalms 50:2). Our Coptic Chirch teaches us to pray looking towards the east. The Churches’ alters faces the east ; not because God does exists only in the east , but according to the book, we expect his coming from the east, just as his star was shining in the east . ” Behold, wise men from the East came to Jerusalem, saying, “Where is He who has been born King of the Jews? 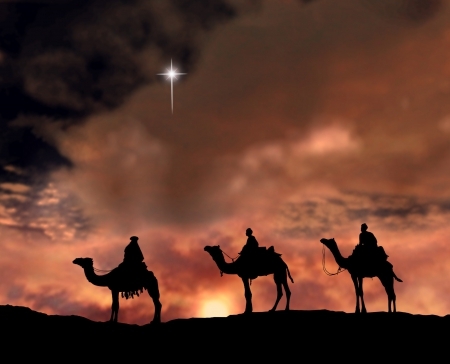 For we have seen His star in the East and have come to worship Him.” ( Matthew 2:1-2). This is to fulfill the prophecy in psalms that says : ” Give ear, O Shepherd of Israel, You who lead Joseph like a flock; You who dwell between the cherubim, shine forth! ( Psalms 80:1). We look towards the east expecting the Lord to shine on us with his salvation ” The people who walked in darkness Have seen a great light; Those who dwelt in the land of the shadow of death, Upon them a light has shined. ( Isaiah 9:2). In the divine Liturgy the deacon calls upon the people to look towards the east , towards the altar where the Body and Blood are placed . In the divine liturgy the word of God is fulfilled ” I am with you always, even to the end of the age.” Amen. ( Matthew 28:20). O great God , we do not tire from looking with our hearts before our eyes towards the east , to be enlightened by your light , to come to you as a church , as a bride of Christ to comply with Isaiah’s calling : Arise, shine; For your light has come! And the glory of the Lord is risen upon you. ( Isaiah 60:1). And no matter how darkness tries to surround and bind the church and the children of God to this world which is under the sway of the wicked ; the light of the Lord will scatter every darkness ” For behold, the darkness shall cover the earth, And deep darkness the people; But the Lord will arise over you, And His glory will be seen upon you. ( Isaiah 60:2). Prophets and believers were eager to see the Messiah through prophecies . Anna, a prophetess, the daughter of Phanuel, in (Luke 2:38) : ” she gave thanks to the Lord, and spoke of Him to all those who looked for redemption in Jerusalem……… And behold, there was a man in Jerusalem whose name was Simeon, and this man was just and devout, waiting for the Consolation of Israel, and the Holy Spirit was upon him. ( Luke 2:25). And here comes the verse in Malachi to enlighten and heal from the east ” But to you who fear My name The Sun of Righteousness shall arise With healing in His wings; And you shall go out And grow fat like stall-fed calves. ( Malachi 4:2). Beloved , regardless to ours sins, or the darkness that Satan or the world wraps us with, Regardless to our experience with evil and death as a result of sin ; in the birth of the Lord Jesus – as the light of this world – is our passage to repentance and life not death ” For it is the God who commanded light to shine out of darkness, who has shone in our hearts to give the light of the knowledge of the glory of God in the face of Jesus Christ. ( 2 Corinthians 4:6). Highness is a character of God, he is worthy, his character outweighs words. Language would never be able to expound God’s highness and grace. The bible though, inspired by the Holy Spirit, was able to reveal to us the depths of God :” But God has revealed them to us through His Spirit. For the Spirit searches all things, yes, the deep things of God. ( 1 Corinthians 2:10). From this aspect we hear the Spirit speaking through Isaiah saying : ” Lift up your eyes on high, And see who has created these things, Who brings out their host by number; He calls them all by name, By the greatness of His might And the strength of His power; Not one is missing. ( Isaiah 40:26). Our God does not look to us lowly , but with his wondrous love came down to us ,looking to our humiliation and death and carried our sins , dying for our salvation. ” Surely even now my witness is in heaven, And my evidence is on high. ( Job 16:19). We have to realize that God has prepared for the salvation of the world through the blood of his only begotten Son Jesus Christ before the foundation of the world. That he is the prince of peace, the source of peace from on high “Dominion and fear belong to Him; He makes peace in His high places. ( Job 25:2). God in the highest, even while on earth is still in the highest and is filling everyone. The Angels clearly announced it when they brought the shepherds the good news : “Glory to God in the highest, And on earth peace, goodwill toward men!” ( Luke 2:14). In the Old Testament, when God called Moses to stand in front of pharaoh in the name of God to let the Israelites go to worship God in the wilderness , he is in the highest and within us : ” And the Lord said: “I have surely seen the oppression of My people who are in Egypt, and have heard their cry because of their taskmasters, for I know their sorrows. So I have come down to deliver them out of the hand of the Egyptians, and to bring them up from that land to a good and large land, to a land flowing with milk and honey, to the place of the Canaanites and the Hittites and the Amorites and the Perizzites and the Hivites and the Jebusites. ( Exodus 2:7-8). Paul says in his first letter to Timothy : ” And without controversy great is the mystery of godliness: God was manifested in the flesh, Justified in the Spirit, Seen by angels, Preached among the Gentiles, Believed on in the world, Received up in glory. ( 1 Timothy 3:16). Manifesting the greatness of our God , how in his highest came down to earth and became man and suffered that he may raise us with him to heavenly places : ” and raised us up together, and made us sit together in the heavenly places in Christ Jesus. ( Ephesians 2:6). In these wonderful days , where we live the blessings of incarnation , seeing Emmanuel our God in our midst and with us all the time , reassuring our hearts of his constant presence . Dearest , did you enjoy the mutual presence of God Who came down from heaven to be with you in person ? Calling you to your salvation and eternal life with an indescribable joy ? ” He bowed the heavens also, and came down With darkness under His feet. ( Psalms 18:9).listen to him say : “Fear not, for I have redeemed you; I have called you by your name; You are Mine. ( Isaiah 43:1) . Let’s give thanks to our great God.